We recognize the importance of protecting your personal information and comply with laws and regulations designed to secure that privacy. www.ferrickmovers.com and m.ferrickmovers.com welcomes comments and questions on this policy. We are dedicated to protecting your personal information, and will make every reasonable effort to keep that information secure. Due to the rapidly evolving technologies on the Internet, we may occasionally update this policy. All revisions will be posted to this web site. Questions regarding this policy should be directed to: Ferrick Bros. Moving Company, L.L.C., 8 Federal Way, Groveland MA 01834. 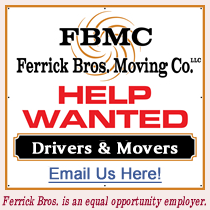 Users may obtain a copy of this policy by 1) printing a copy of this policy from our web site, or (2) requesting a copy via mail at: Ferrick Bros. Moving Company, L.L.C., 8 Federal Way, Groveland MA 01834.